A few days ago I posted an article regarding planned legislation that “would hit the poorest kids the hardest” here in the US. In that post I pondered how many people who voted for the current administration (or didn’t vote at all) will be impacted by such legislation. Here were are today with another potential example of voting against your own self-interests. I wonder if any of the business owners mentioned in this article voted for this administration, an administration which has put a policy in place that may lead to the swift end of their business. From what I gather from the article, their businesses were improving under the previous administration. I wonder how they felt about the previous administration. Raleigh Denim Workshop Source: Raleigh Denim Workshop Victor Lytvinenko is thumbing through emails on his iPhone trying to find the one that best shows the damage the global trade war has already done to his little, decade-old American jeans company. The 37-year-old — dressed in a black t-shirt, rolled-up blue jeans and a pair of Stan Smiths — eventually looks up after finding the message. It’s from a customer in Scotland who’s apologizing for canceling an order worth tens of thousands of dollars. The reason? The shop owner balked at paying an additional 25 percent tariff the European Union slapped on American-made jeans in June as part of its response to President Donald Trump’s duties on steel and aluminum. Lytvinenko was in Manhattan in late July for an apparel trade show. The annual trip was usually a fun excuse to catch up with customers or play ping pong over beers with friends also trying to earn a living making clothes in the U.S. But this year was different. The talk was very much about how American-made jeans — of all things — had been pulled into the trade spat. It’s the latest gut punch for an industry that had already declined into a shell of what it once was. In the past year, two of the last-standing major denim mills closed, including the biggest: Cone Denim’s facility in Greensboro, North Carolina, that many firms say was the last to make high-end denim fabric in the U.S. on a large scale. Increases in California’s minimum wage also helped drive several apparel factories in Los Angeles to shutter or move to Mexico, adding to a tumultuous year for an industry that’s been just hanging on. On top of that, free-trade agreements had been pushing blue jean-making overseas for two decades, and now the remaining manufacturers can’t believe the irony of getting hit by a return to protectionism. Major brands, like Levi Strauss & Co., had already largely bailed, shifting almost all of their production to Asia or Mexico. 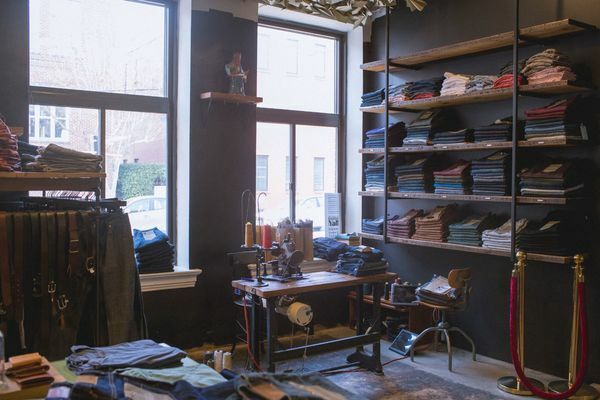 What’s left is mostly small businesses surviving by pitching craftsmanship and Americana in the premium end of the market with jeans priced at $200 or more. American blue jeans were born in San Francisco in the 1870s, and became a symbol of the frontier with Levis Strauss making the first pairs for miners working in the California gold rush. By the 1960s, they had evolved into a fashion emblem of cool and rebellion after pop icons like actor James Dean wore them. The EU no doubt had symbolism on its mind — it placed duties on bourbon, too. Europe had already been a difficult market for American-made brands because it protected its apparel and textile industries. The EU had 12 percent duties on jeans in place, meaning that with the additional tariff, importers are now on the hook for 37 percent. “It is a slap in the face,” for companies dedicated to American manufacturing, said Scott Morrison, the founder of New York-based premium denim company 3×1. With two decades in the industry, he’s one of the few to survive the great migration overseas. So far, the company has been sharing the cost of the tariff with a European distributor and avoided raising prices, but “we are not sure if it’s sustainable for a small business like ours,” Morrison said. The production of blue jeans is a testament to how global trade has evolved. The cotton can come from the U.S. and be made into denim in Pakistan. The cutting and sewing then might take place in Indonesia and finished off with buttons and zippers from China. But making jeans still requires more labor than other clothing because of all the sewing and finishing touches like making them look distressed. And while moving production to lower-cost markets has reduced prices for consumers, it’s also given big companies even more advantages. Larger firms have the money and expertise to adjust their supply chains. Their clout also gives them leverage to pressure suppliers to take on cost increases. If they don’t oblige, production can be moved. That’s what happened in L.A., with minimum wage hikes convincing some brands to source from Mexico — where labor is much cheaper, according to Ilse Metchek, president of the California Fashion Association. Of course, moving to Mexico is so advantageous because jeans can be shipped into the U.S. without any duties under the North American Free Trade Agreement. But Nafta is also what helps make Canada, a member of the pact, the industry’s biggest export market at more than three times the size of the EU at $108 million last year. There are other bright spots, too. A new denim mill is being built in Louisiana. Plus, Denimburg in Edinburg, Texas — a large mill that’s just a few years old — is witnessing increased demand for made-in-America fabrics from brands like Calvin Klein. 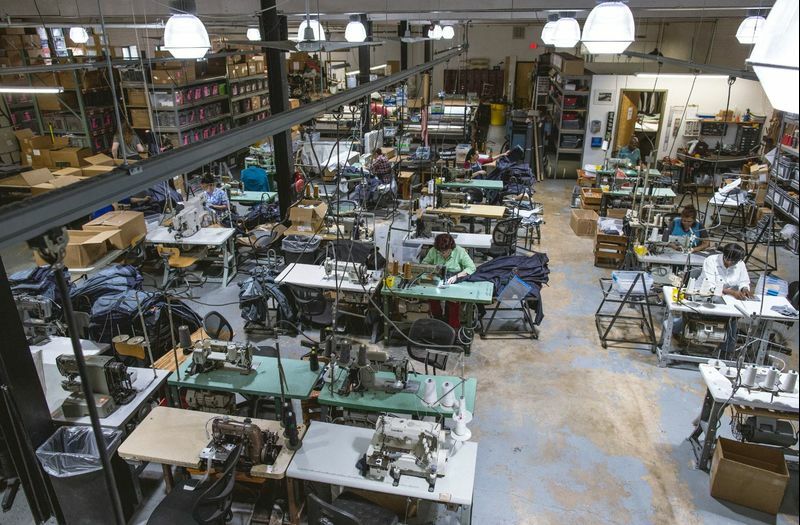 Back at Raleigh Denim, which makes jeans at a 7,000 square-foot factory in the downtown of North Carolina’s capital city, Lytvinenko is still worried about the tariffs because some European customers aren’t responding to emails about their next round of orders.